Even though their numbers have plummeted by over 90%, the greater sage-grouse was denied listing in 2015 as the result of an unprecedented collaborative recovery effort across 10 Western states called the Sage Grouse Initiative. This conservation effort cost hundreds of millions of dollars and is praised for its consideration of many different stakeholders- from ranchers to environmentalist. But stretching across the aisle and compromising doesn’t seem to be something that Secretary Zinke values. The greater sage-grouse population used to number in the tens of millions, but thanks to poor farming practices and development, their numbers have dwindled to only a few hundred thousand since the early 1900s. Sage-grouse are an “indicator species,” meaning their health (or lack thereof) reflects the health of their entire ecosystem. 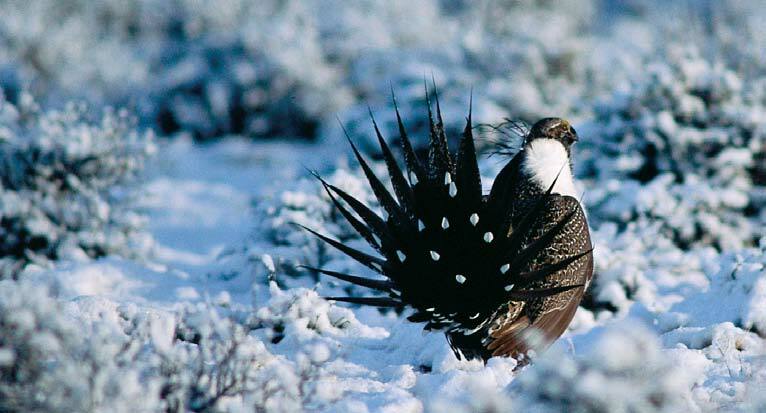 If the sage-grouse is healthy, the sagebrush sea is healthy, too. In addition to the greater sage-grouse, 350 other species rely on the sagebrush, including the incredibly fast pronghorn, the adorable pygmy rabbit ❤️, and the badass badger. Unfortunately, all these species and more are suffering from an ever shrinking and disappearing habitat. And to make matters worse, the Sage Grouse Initiative, along with years of work, could disappear, too. This successful and collaborative effort to conserve the greater sage-grouse could be the best path forward for these imperiled birds. The initiative has been praised by governors and members of Congress from both parties, including Governors John Hickenlooper (D-CO) and Matt Mead (R-WY) and Senator Michael Bennet (D-CO) (If you’re in Colorado, thank Senator Bennet here! ). Yet, Secretary Zinke wants to ignore all the progress to date and go back to square one. A future Zinke-approved plan could be a giveaway to oil and gas interests intent on opening up even more sage-grouse habitat, putting these birds and countless other species at risk. The greater sage-grouse needs your help! Please sign the petition to Interior Secretary Ryan Zinke asking him to respect the existing Sage Grouse Initiative and abandon his plans to rewrite it! Please stop the endangerment of the greater Sage-Grouse habitat. There is no need to do this.